Here is a listing of local facilities that you may find of interest when planning your visit here. This pub is popular for its Real Ales a food and has featured in the Good Pub Guide. Open from mid-day. Find out more by clicking here. This pub serves Real Ales and great fish and chips. Find out more by clicking here. The cafe next to the lifeboat house, serving the full English and various breakfast permutations, and family-friendly food. Open 9-3pm. Find out more by clicking here. Just opposite the village shop, this gallery and tea room offers local art and delicious homemade cakes. Open Friday to Sunday 10.30 to 4.30pm. (closed Christmas to mid-March). Find out more by clicking here. Has a wide range of items for creating your picnic to keep you going on your visit. A small friendly holiday park with a genuine family feel. Find out more by clicking here. This large car park and toilets with disabled access are now run by Icklesham Parish Council and a donation in the boxes from you will help maintain them for the future. 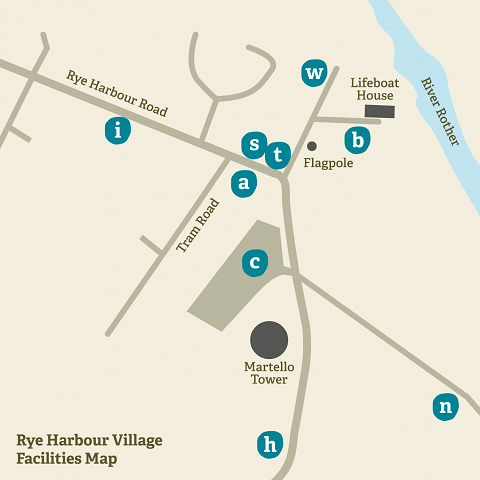 Open 10-4pm (5pm in summer) for information and sales about the reserve and from the local area. Information about present and past lifeboats. Find out more by clicking here. The church of the Holy Spirit at Rye Harbour was built in 1849, designed by Samuel Sanders Teulon. Find out more by clicking here. B&B in a delightful Victorian house standing prominently at the very end of Harbour Road, right at the main entrance to the nature reserve. Find out more by clicking here. Sea Road. Licensed supermarket: Post Office, videos, newspapers, fresh bread baked daily, groceries, lottery, snacks, cash machine. Find out more by clicking here. The beach side cafe is now open 10-3pm at the east end of Pett Level and the TripAdvisor reviews are good. Find out more by clicking here. This small car park and toilet with disabled access are maintained by Rother District Council at the west end of the nature reserve. More information about Winchelsea Beach can be found by clicking here.